This stunning photography book captures the spirit of the now almost lost tradition of the English seaside holiday. The photographs - all taken from English Heritage's unique collection of over ten million images held in the National Monuments Record - show how we used to take our summer holidays before cheap flights and package deals made foreign holidays affordable to all and led to the decline of the English seaside resort. 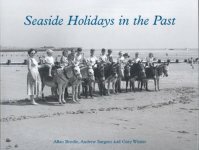 From Victorian bathers to 1950s beach huts, from 19th-century fishermen to long destroyed landmarks such as New Brighton's tower (higher than its more famous rival, Blackpool) and from Punch and Judy shows to donkey rides, the book reminds us how we have changed as a nation and what we have lost forever. The book includes some very unusual shots of amusement parks, including Morecambe's Winter Gardens, Southport's Pleasureland, Blackpool's Pleasure Beach and Great Yarmouth's Pleasure Beach.